Beautiful Oceanfront 3 BR/ 3 BA condo in Captains Quarters Bldg in exclusive, gated seaside resort. Litchfield By The Sea offers tennis, walking/biking trails, restaurant/bar, health club, spa, stocked lakes and miles of pristine, never crowded beaches. Within minutes, you can be golfing, shopping, dining at world class restaurants or anything else that might interest you on vacation. The master bedroom has a king bed, ceiling fan, flat screen cable TV w/ DVD and private bath with large shower, double vanity and oversized tub. The 2nd bedroom has king bed, ceiling fan, cable TV w/DVD and private bath. 3rd bedroom has 2 twin beds, ceiling fan, cable TV w/DVD and bath. Living room has brand new sofa with pull out bed, 3 comfortable chairs and large center coffee table. Kitchen/Dining has large table for 8 and a food bar with 3 additional seats. Call for further information and availability. Nightly, weekly or monthly rentals available. Peak months (June, July, August) are rented thru rental company. Please contact me for further information. Off-Peak months can be rented thru me. If you would like me to send you a virtual tour of the Condo - please e-mail me. Virtual tour will give you a better view of entire unit and the views. I have owned the condo since 2005, we love the place and take great care of it. I live in Anderson, SC. I run a restoration company and love to go to the beach when i can. We love the location, it is quite, peaceful and the views are magnificent. 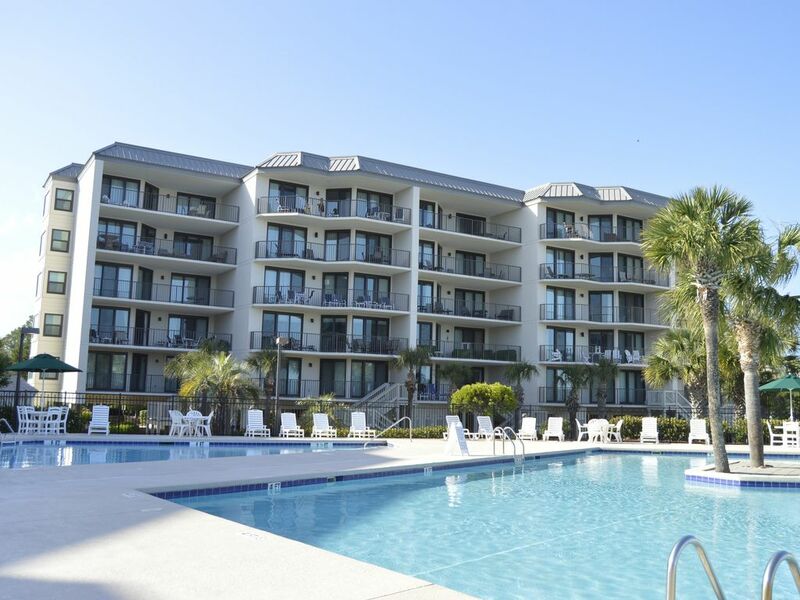 it is a great family place and is close enough to Murrells Inlet and Myrtle Beach that you can get there in no time at all. the only thing between the condo and the beach is the pool area. We have everthing you may need in the kitchen. Balcony has tons of square footage, table, 4 swivel chairs, and 2 lounge chairs with a small table. Great Views, Very Relaxing. There is a large pool for the kids to play and then another pool beside the big pool. Beautiful views of ocean, pools and resort property, Each bedroom has a flat screen tv with dvd player built in. living room has a 42" HD flat screen with dvd player. Condo is fully furnished and is decorated to the max. This is like your home away from home. there is plenty of room through out condo and on balcony. This is our third year staying and it is the nicest condo we have found. Love the new cookware. Thanks for another great year. We were very pleased with the cleanliness, views from the nice sized balcony, comfortable beds and decor of the condo. Was a very relaxing and fun week with easy access to beach and pool. My family and I would love to stay here again in the future! Thoroughly enjoyed our week in Pawley's Island at the beach. The location was perfect. The balcony was large and overlooked the pool with a nice view of the ocean beyond. The rooms were nice sized, and the beds we're comfortable. A grocery store was just outside the resort property while Murrells Inlet was 10 minutes away. The beach was not very crowded and easily accessible. We thoroughly enjoyed our family vacation at this condo! The convenient access to the pool and the beach, great local restaurants, the state park, golf, and shopping made this an ideal spot! Our children 3 and 1 had an absolute blast also and it was so enjoyable to spend time with them in the condo, at the pool, and on the beach without the hustle and bustle that many of the more commercialized beaches have. The beach was so clean and the grounds of the condo were too. We are definitely looking forward to our next Pawley's Island vacation at Litchfield by the Sea!!! We rented this unit again over spring break. It continues to be well maintained and well stocked with the kitchen essentials. When rented with the other unit avail on VRBO in the same building it makes for a great family reunion. Everything is as depicted in the photo's. At least in the off season linens are not provided so don't forget to bring them or you will have to rent all of them. Very nice condo at a great location! We really liked the property and the location was superb. The condo itself was nicely appointed and the community it is in is very well managed. The decorating was tasteful but not lavish. The beds were very comfortable and the bedroom space was roomy (no pun intended). We have stayed in this property before and would certainly put it at the top of our list for future MB SC visits. Walking trail, bike paths, tennis courts available, pool and out tub located in area between condo and ocean.